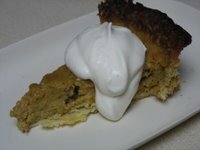 My first attempt at making a pie completely from scratch was one of my very favorites, pumpakin. Considering the zillions of variations on this one recipe that exist, I chose one I'd never tried before: the version made by Eggbeater's own Shuna. As I do when I'm cooking, I used her recipe as a guide, adjusting things here and there to suit my tastes. I did follow her crust recipe to the letter, though, and then turned to the Joy of Cooking for further help on what happens after you mix all the ingredients together. Since I can't afford a fancy Kitchen Aid mixer, I mixed the butter into the flour by hand, with a pastry cutter that I bought ages ago for the very purpose of making pie crust. Finally, I got to use it for its intended purpose! Unfortunately, it's a little bent now from living in the back corner of the utensil drawer for so long. Making the crust was a little bit of a challenge. It was so sticky that the first time I rolled it out, it ended up sticking to the counter. So I dusted the surface with more flour and tried again. Take two was a success — and I even managed to roll the dough onto my rolling pin to transfer it into the pie pan. I was rather proud of myself, actually. It was starting to look like a real pie! While the crust cooled, I whipped up the filling. I used pumpkin that I had roasted and mashed up the night before and adjusted the seasonings so that it was similar to what The Joy of Cooking suggested, since I like my pie spicy. This meant that instead of two teaspoons of spices, I threw in about four or five and included some nutmeg as well. I noted that Shuna's recipe calls for less squash and also less sugar than the recipe in the cookbook, but I figured I didn't want to alter her recipe too much and only added a third of a cup more pumpkin. Once the filling had met the crust, I gave the edge a little suit of foil armor to protect it from getting any browner. And into the oven it went. Forty-five minutes later... It was pie! The Anthropolgist and I sat down for our first taste, which was done naked — that is, without any toppings. He liked it; he thought the crust was well done and tasty and that the filling had the right amount of sweetness, although he didn't think the minced sage did anything at all for the flavor. Being a harsher critic of the food I cook, I tasted it with a more critical tongue. I liked the sweetness of the crust (Shuna's recipe calls for more sugar than the cookbook's did), but I was not successful in preventing it from sticking to the bottom of the pan and I was still sad about the burnt edge. 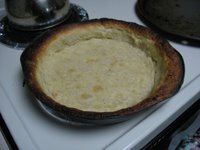 I also thought the crust was too thin in some places and, overall, a little tougher than I would have liked. 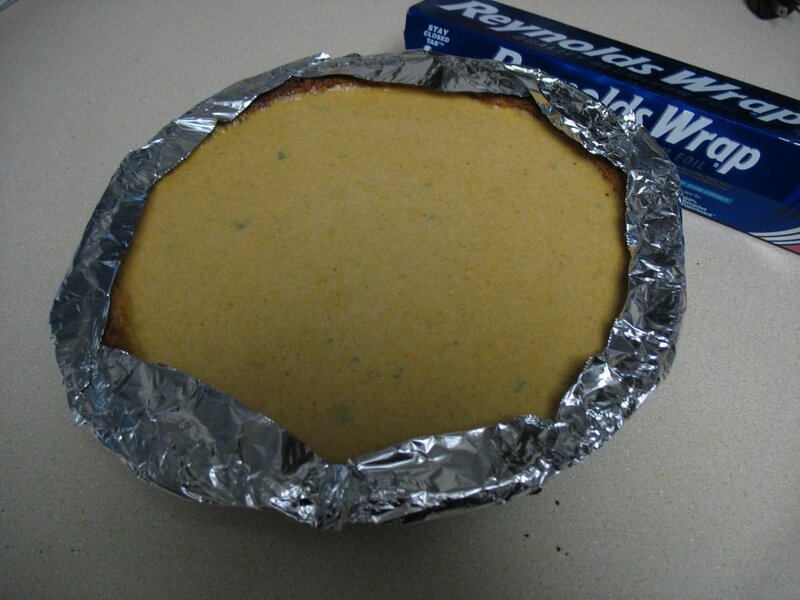 As for the filling, because I had used fresh pumpkin and hadn't thought to drain the liquid, the filling was slightly runnier than I was expecting. It also wasn't sweet enough for me — and definitely not spicy enough either. It was more like a wobbly quiche; the Anthropologist agreed that it would be good for breakfast. So for next time: Use canned pumpkin. Add more sugar and more spices. Nix the sage. As for the crust, I think I just need more practice making them. Maybe I'll use a recipe from Bon Appetit this time. Perhaps a caramel-pumpkin pie with some bourbon whipped cream? "I give this a B-minus," I declared. "Out of what?" the Anthropologist said. "10?" "Yes, a B-minus out of 10." "I give it a B-minus out of 10, too." I have problems rolling out crust. I think you have to do it a lot. Well, I'm really looking forward to the next pie! This one looked pretty good to me! 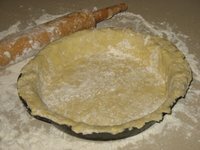 Mike - Considering all the vegetarian options that are now available in grocery and health food stores, there's probably a ready-made pie crust out there with a non-lard option. But I'm all for you just doing it yourself! Sher - Thanks! I'll be making my next one soon. Oh, pumpkin pie, my friend. Your home-made one looks so gooey and delish, especially with that dollop of cream on top. Sigh.